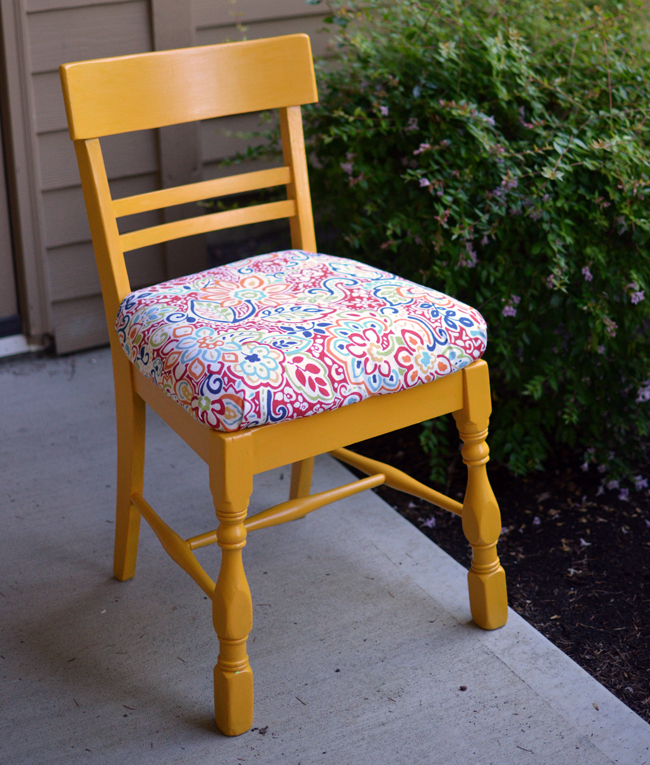 ' Yellow Craft Chair >> Tutorial - Sisters, What! We just moved across the country and in the process got rid of pretty much all of our chairs. They we're old and ready to go anyway, but needless to say when we got to Portland I suddenly had no chair to sit on while I sewed or did any thing else. Standing and sewing is just a little awkward, just a little. It kind of felt like I was doing some weird yoga move, but I was sewing. You probably get the point. A new chair was needed. After a trip to goodwill and ta-da! I found this beauty for $5. 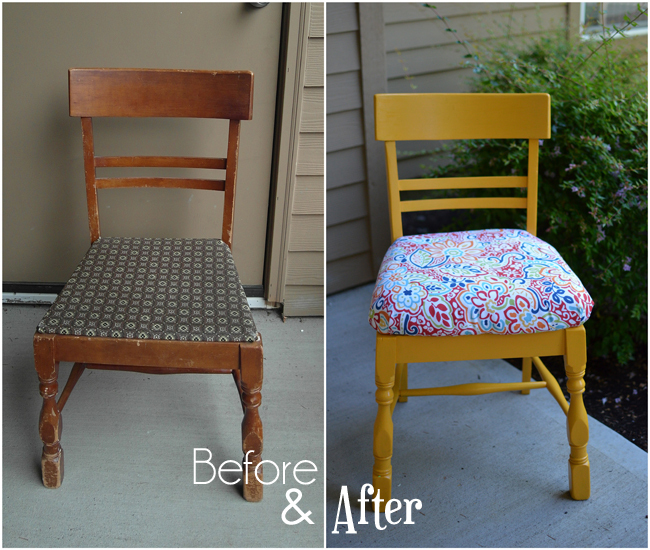 Nothing a coat of paint (or two or three or four) couldn't fix up nice. //1// First we did a quick sanding down of the chair. Not all the way to the wood, just enough so the paint would stick. 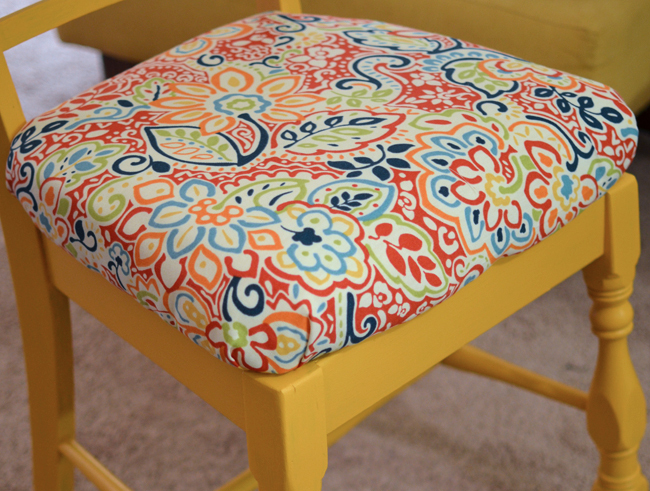 Then we painted the chair. I thought about doing spray paint, but personally I'm not the biggest fan and so I bought a sample of yellow at Lowes and painted it. The paint sample was on sale so I paid only $1.50 (which was actually cheaper than spray paint and easier on the fingers). After we painted it (I did like 4 coats to cover up the color), we added a basic lacquer to keep it from chipping. //2//Unfortunately, after we screwed off the seat, we found that we needed a new board. So off to Lowes again, we got some plywood - I think it was $10. The wonderful hubby cut it up the perfect size. (the plywood was super big, but I plan on doing a really awesome art project with the rest of it in the near future). //3// now for the final part we added the foam and batting. I had some left over from some project, but it was not as thick as I wanted so I tripled it. I wanted my bum to feel super comfy : ). Make sure you cut your foam/cushion to overlap the actual seat by an inch. Then staple your fabric on. I recommend asking for help on this one. For a good tutorial on this part go here. 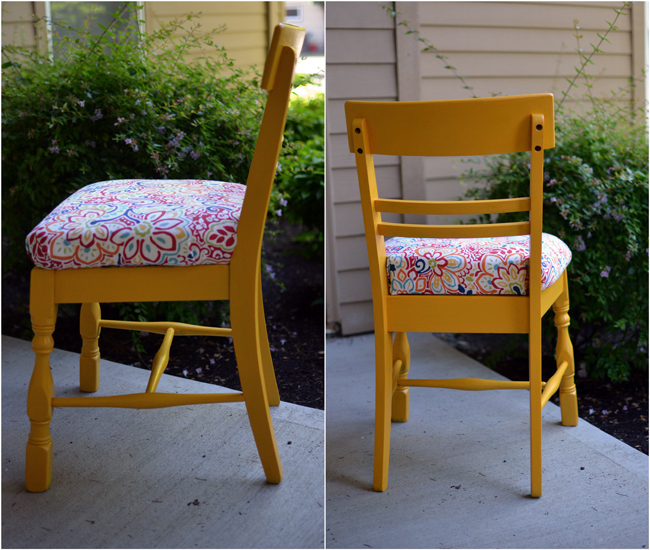 //4// The last step was to screw the seat back into the chair. Not a bad price for a custom chair just for me. And seriously, check out that cushion...my bum has never been more happy.